My wife’s birthday was the other day and she had been wanting a MacBook to go with her iMac. Proprietary software is not my thing, but it makes her happy. Problem: nowhere near enough $ to buy one. Not enough $ to buy an iPad either (if they were even for sale here, that is). So we talked a bit and really she just wanted something portable for her games… and what I ended up doing was buying a cheap netbook (the older model MSI Wind U100) and started learning everything I could about making a ‘hackintosh’ out of it. Now, when talking about what could (theoretically) be done, try not to sound too confident since you may just get asked to that in practice ;) Basically, yes, it would be nice if she could run her XP games too and Ubuntu would be icing on the cake… so I started learning about how to make a triple-boot system. Two days of on-and-off tinkering later, I emerged from my room with a kludged together system that actually can boot successfully :) I used the SnowyWind OS X distro and Grub2 and Chameleon… it’s not perfect, but it boots OSX/WinXP/Ubuntu 10.04 consistently. XP is ancient; a real clunker. Had to use an external USB CD-ROM (USB flash drives can be used in theory, but this was just easier). Sloooooow install. 25-character key in tiny print to read off the sticker on the bottom. WGA. A mountain of security patches. 3rd party drivers to make the hardware work. Would love to toss it in an internet-free VirtualBox cage and throw away the key if I could. Hackintosh distros are still rather… brittle. Reminds me of the reported difficulties of Linux pre-Ubuntu, mixed with the groping around in the dark feel of doing things with proprietary software that the original authors didn’t want you doing. Feels like a ‘square peg in a round hole’. Adding more OSs always makes things more complicated :) No “average user” will ever want to mess with bootloaders and when something goes wrong, you might as well reinstall. Unless you have a real reason to want XP (games… sigh), or OS X on non-Apple hardware (games… heh), you really are just setting yourself up for a headache down the road. Ubuntu installs fast, is very straightforward, small and netbook-friendly. Oh and there are even proprietary games for it these days too. Microsoft’s Head of Security and Privacy in the UK has told TechRadar that people who jump ship from Internet Explorer after the recent spate of bad headlines risk ending up on a less secure browser. With France and Germany both advising a move away from Internet Explorer, things are far from rosy for Microsoft’s browser […yet] Microsoft’s UK security chief Cliff Evans insists that a non-Microsoft browser is the worse option. “The net effect of switching [from IE] is that you will end up on less secure browser,” insisted Evans. “The risk [over this specific] exploit is minimal compared to Firefox or other competing browsers… you will be opening yourself up to security issues. Miguel de Icaza, Microsoft MVP? Yep, it’s true. The open-source rabble-rouser who was prevented from hosting a session inside Microsoft’s 2005 Professional Developer Conference has been accepted into the ranks of the company’s “Most Valuable Professionals” less than five years later. He announced the news on his blog. De Icaza is the leader of the open-source Mono project, sponsored by Novell, which previously set off alarm bells inside Microsoft for its ability to expand Microsoft .NET applications to other platforms, including Linux. Relations between de Icaza and Microsoft have warmed following the Redmond company’s partnership with Novell. He’s also on the board of the Microsoft-supported CodePlex Foundation, Meanwhile, Mono spin-off project Moonlight, an open-source implementation of Microsoft’s Silverlight interactive technology, has won the blessings of the Redmond company. De Icaza was accepted as a Microsoft MVP for C#, the .NET programming language. …and realize that now it’s 2010 and NOTHING has changed as far as that’s concerned; Linux has to try and claw its way onto machines where it can, mostly used Windows systems for which the hardware was not Linux-optimized. And now getting back to Mono, realize that Microsoft controls the show; that ultimately they will steer it in the direction they want (to Windows sales) just as they have done with Microsoft Office document formats that really only work perfectly in Microsoft Office. If we follow that route, we will only ever be a ‘Windows knock-off’. We need to take a page from the ODF struggle and refuse to play the game by Microsoft’s rules. I really think that collectively we need to say no to Mono just as much as if Microsoft wanted us to use Bing as Ubuntu’s default search engine. Apparently Ballmer just had his 10th anniversary as Microsoft CEO; the tactics may change somewhat, but realize that Microsoft is still not our friend. And this brings us, finally, to Linux. Currently about a third of netbooks are being shipped with Linux globally and this should rise to a majority by 2013. This is the beginning of Linux taking over the low-end of ‘desktop’ (that is, ‘not server’) computing. What I think will happen this coming year is going to be a convergence of technologies that are going to result in that sub-$200 machine, and it won’t have Windows XP or 7 on it. But unlike the current generation of netbooks that are Intel Atom-based, these will run on ARM processors. Predictions include that 20% of 2010’s netbooks will have ARM processors and the amount will be over half by 2012. And while Google’s Android will be on some of them, Ubuntu stands to grab a large amount of the market with its 10.04 LTS release. So, will 2010 be the year of ‘desktop’ Linux? I think yes, but in a way that I didn’t quite imagine in 2007. The “major commerical apps designed to run on Linux” aren’t “designed to run on Linux” per se; they’re designed to run in standards-compliant web browsers (e.g. Firefox) and are ‘free’ (gratis) ala Google (mail, maps, news, etc.) The low-end of computing will be amazingly inexpensive, almost disposable in the new and uncharted sub-$200 range (the “race to the bottom“). We probably will see lots of Asian OEMs that most in the west have never heard of before cranking these out (perhaps even toy manufacturers; look at this one that uses rechargable AA batteries! :-), while the bigger ones attempt to maintain their Windows-based notebook sales. For less than half the cost of buying the proprietary software from M$, they are buying a COMPANY that is producing the Linux-based solution. * The cost savings are estimated to be ~$15M per year! * The speed of the system will improve by ~7x! * AND the tech will likely replace the Microsoft offering in other markets too! Slashdot recently featured a post (mirrored here with working images) that shows what Microsoft is telling retail employees to tell customers to get them to not buy Linux netbooks; it’s the usual sleazy marketing FUD we expect from Microsoft. Microsoft also specifically targets Ubuntu regarding their update process. I have to say that Microsoft seems to think that the world only wants to run Microsoft apps that can be updated through Windows Update, since my memory of updating other software on my system in Windows is that it was a mess. Also, Microsoft’s once-a-month Patch Tuesday approach to software updates leaves people vulnerable most of the month; it was designed to cut down on the amount of negative press of patches constantly being released for severe security issues. Finally, I should mention a sneaky sleight-of-hand Microsoft doesn’t want you to notice: when dissing Linux, they mention “Because there are different ‘flavors’ of Linux, you can’t learn one version and be sure you know them all.”  yet at the same time, they say “Most customers have used Windows before. Windows 7 offers many new features, but it still provides the same great Windows experience they’re familiar with.” What they fail to mention is that most customers have used Windows XP before. Switching from XP to Vista usually involved a steep learning curve since Microsoft seemed to have made ‘change for change’s sake‘ all over in Vista. The XP to 7 learning curve should be similar; I seriously question whether it would be easier for XP users to migrate to Vista/7 rather than Mac OS X or Ubuntu. In short, if you know someone is going to buy a netbook and you know more than they do about computers, go with them and make sure they don’t get suckered into buying a Windows lemon if that’s not what they need. This translates well to Microsoft; consider their market capitalization as their ‘weight’; at its peak about a decade ago, Microsoft briefly spiked to over $600 Billion. At the time, IBM sat in the 100-150 range and Apple was stuck ~25. The other challenge has been, in order to keep the price points down, a lot of people thought that Linux would be the saviour of all of these netbooks. You know, there were a lot of netbooks loaded with Linux, which saves $50 or $100 or whatever it happens to be, based on Microsoft’s pricing and, again, from an industry standpoint, there were a lot of returns because people didn’t know what to do with it. Linux, even if you’ve got a great distribution and you can argue which one is better or not, still requires a lot more hands-on than somebody who is using Windows. So, we’ve seen overwhelmingly people wanting to stay with Windows because it just makes more sense: you just take it out of the box and it’s ready to go. I’m going to call ‘revisionist history’ on Lenovo BTW; People didn’t want “to stay with Windows”, they wanted to stay with Windows *XP*. Yet at the same time, XP (which is still much more widely used than Vista; e.g. see Net Applicaitons and Stat Counter) had all but gone extinct on regular machines from the big OEMs. Thus there was a high demand for it with low supply. When XP netbooks entered the market at a price point of less than half what Vista notebooks cost, they sold quite well as you might have expected! You’ll note that while there are fewer Linux-based netbooks than XP ones available, you don’t see any in stores with Vista O:) Also it turns out that Microsoft only charged the OEMs $15 per XP Home license on netbooks which explains why they didn’t cost significantly more than the Linux ones. And while MSI apparently had 4x (!) higher return rates on their SUSE systems than they did with those preloaded with XP, Dell’s netbooks shipping with Ubuntu (a full third!) had about the same return rate as those with XP. What this says to me is that MSI didn’t do a good job of picking/testing/tweaking/marketing their distro of choice, while Dell did. My prediction is that companies which decide to put Windows 7 Starter (limited to 3 concurrent applications… can we say “crippleware”? ;) on netbooks are going to have unhappy customers and low sales, those who continue to preload XP will continue to do well and those that preload Ubuntu will see increasing sales. I just realized a way that Microsoft could go a long way towards soothing-over the Vista fiasco, while generating goodwill among Windows users, undermining Linux adoption, making lots of very good press and really not costing Microsoft very much money (seriously, I can’t imagine much more than those terrible ads with Gates and Seinfeld). Let legitimate Windows Vista keys work for Windows Seven. IOW, let Windows Vista users upgrade to Windows Seven for free (gratis). Windows [VERSION] is already on its “second edition.” To get what are essentially bug fixes, Microsoft charges Windows [VERSION] users $[AMOUNT], for the second edition of the same product. (Creating yet another opportunity to charge consumers more money so its products will function properly). If M$ did that simple thing, do you doubt that it would have the effects I described in the first part of the post? 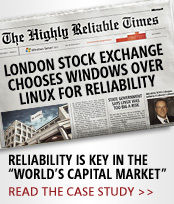 Do you doubt that Ballmer & Co. will never do it? I have to say that the different Windows Se7en DVD versions look pretty… Ultimate is in the middle.